In September 2010 Scene Change Theatre Company started working with the education department of Guildford Cathedral to create a play for local schools to mark the 50th anniversary of the Cathedral. The project was called Bricks in the Wall after an ingenious post war campaign to get local people to fund the project by buying a brick. We worked with 400 primary school children over 3 days from 25th -27th. The play looked at how and why the cathedral came to be built and the influence and involvement of the local community in this. 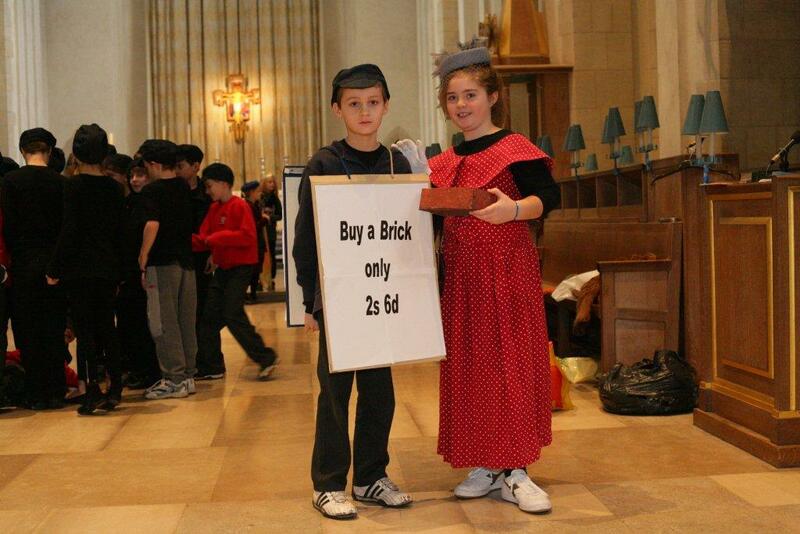 The children showed snapshots of history that the Cathedral had lived through, from children acting out workers on a building site that became the Cathedral to the The Jarrow Crusade and through the 2nd World War years. The finale scene was perhaps the highlight as the children performed a dance showing the last 5 decades with Beetle mania, Disco, Kraft Work Techno and Robbie Williams ushering in the new millenium. To view some images from the 3 day performances click on this Photos and Media link. The Cathedral also ran a blog called Guildford Cathedral is 50 highlighting the stages of the projects development.